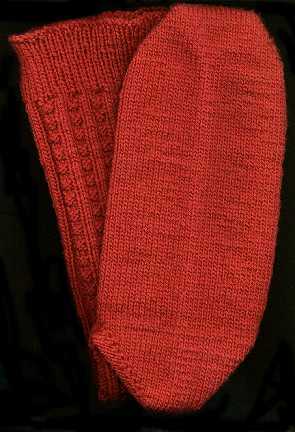 The Socknitter's List was challenged to kick sample socks for the patterns on the Internet that did not have pictures...I had been wanting to try a toe-up pattern so I picked "Karen's Red Socks." 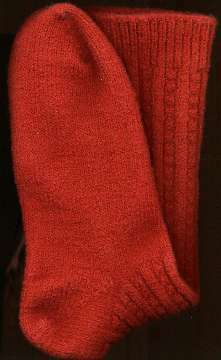 If I had read the whole pattern before I volunteered, I MIGHT have noticed they were knee high socks...sheesh! 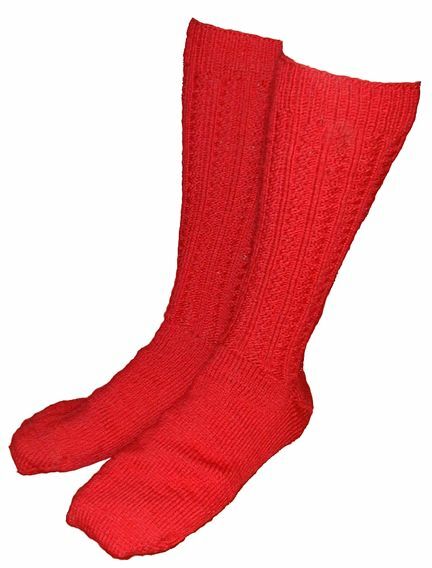 I used bright red Majestic Merino I got on Ebay with size 2.5mm needles and my gauge is larger than the pattern because I plan to felt the feet. The pattern was easy to follow with a few slight exceptions. In the short row toes, the author picks up each wrap on two rows...but, in the beginning, I couldn't figure out what was being picked up the second time...so I didn't. And I would make the toes narrower in the future. Also I did NOT decrease in the ribbing at the top...hey...I was really working hard on following the pattern...but after ten thousand miles of leg...I just had to break free! Picture on the left is after washing once in hot water (and dried in the dryer)...and then washing again in warm water. 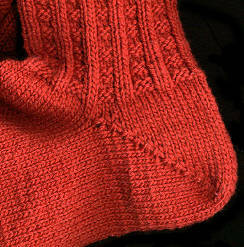 The socks fulled nicely and have a WONDERFUL feel!